MP3 - Version 2 has Steve Moore as the voice of the son. MP3 - Version 3 has the Steve Moore vocal, but with later orchestral overdubs atop an inferior acetate with surface noise! (this version became the 1969 released one). MP3 - Version 4 has the Steve Moore & Dottie Dillard vocal versions combined, but slightly out of precise synch, causing it to phase out. 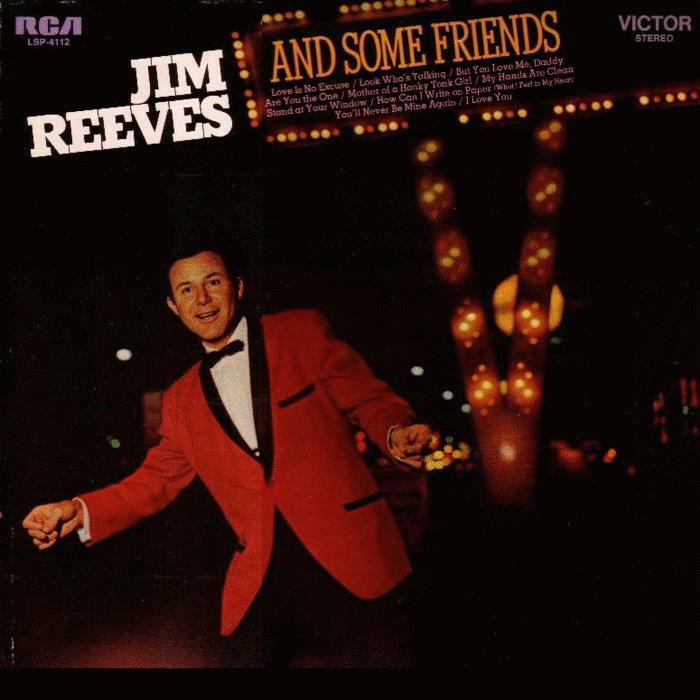 ©1959 by Open Road Music, Inc.
b. James Travis Reeves, 20 August 1923, Galloway, Texas, USA, d. 31 July 1964 (Reeves' plaque in the Country Music Hall Of Fame mistakenly gives his date of birth as 1924). Reeves' father died when he was 10 months old and his mother was left to raise nine children on the family farm. Although only aged five, Reeves was entranced when a brother brought home a gramophone and a Jimmie Rodgers record, 'Blue Yodel No. 5'. When aged nine, he traded stolen pears for an old guitar he saw in a neighbour's yard. A cook for an oil company showed him the basic chords and when aged 12, he appeared on a radio show in Shreveport, Louisiana. By virtue of his athletic abilities, he won a scholarship to the University of Texas. However, he was shy, largely because of a stammer, which he managed to correct while at university (Reeves' records are known for perfect diction and delivery). His first singing work was with Moon Mullican 's band in Beaumont, Texas, and he worked as an announcer and singing disc jockey at KGRI in Henderson for several years (Reeves eventually bought the station in 1959). He recorded two singles for a chain store's label in 1949. In November 1952 Reeves moved to KWKH in Shreveport, where his duties included hosting the Louisiana Hayride. He stood in as a performer when Hank Williams failed to arrive and was signed immediately to Abbott Records. In 1953, Reeves received gold discs for two high-voiced, country novelties, 'Mexican Joe' and 'Bimbo'. In 1955 he joined the Grand Ole Opry and started recording for RCA in Nashville, having his first hit with a song based on the 'railroad, steamboat' game, 'Yonder Comes A Sucker'. Chet Atkins considered 'Four Walls' a 'girl's song', but Reeves persisted and used the song to change his approach to singing. He pitched his voice lower and sang close to the microphone, thus creating a warm ballad style which was far removed from his hillbilly recordings. 'Four Walls' became an enormous US success in 1957, crossing over to the pop market and becoming a template for his future work. From then on, Atkins recorded Reeves as a mellow balladeer, giving him some pop standards and replacing fiddles and steel guitar with piano and strings (exceptions include an album of narrations, Tall Tales And Short Tempers ). Reeves had already swapped his western outfit for a suit and tie, and, in keeping with his hit 'Blue Boy', his group, the Wagonmasters, became the Blue Boys. He always included a religious section in his stage show and also sang 'Danny Boy' to acknowledge his Irish ancestry. 'He'll Have To Go' topped the US country charts for 14 weeks and made number 2 in the US pop charts. In this memorable song, Reeves conveyed an implausible lyric with conviction, and it has now become a country standard. 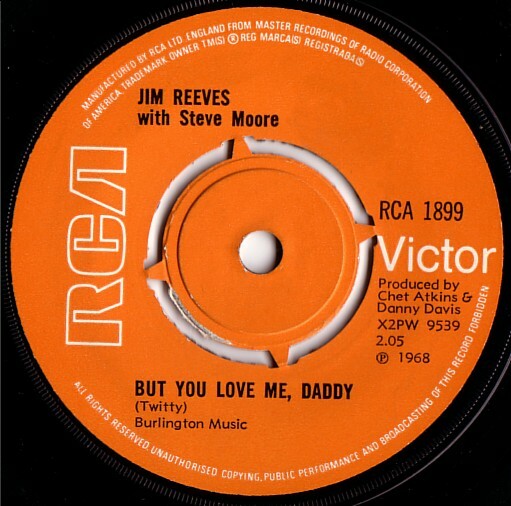 A gooey novelty, 'But You Love Me Daddy', recorded at the same session with Steve, the nine-year-old son of bass player Bob Moore, was a UK Top 20 hit 10 years later. 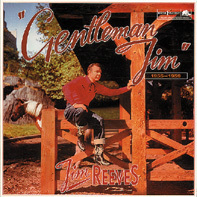 Having established a commercial format, 'Gentleman Jim' had success with 'You're The Only Good Thing', 'Adios Amigo', 'Welcome To My World' (UK number 6) and 'Guilty', which features French horns and oboes. His records often had exceptional longevity; 'I Love You Because' (number 5) and 'I Won't Forget You' (number 3) were on the UK charts for 39 and 25 weeks, respectively. He became enormously popular in South Africa, recording in Afrikaans, and making a light-hearted film there, Kimberley Jim, which became a local success. Reeves did not like flying, but after being a passenger in a South African plane that developed engine trouble, he obtained his own daytime pilot's licence. 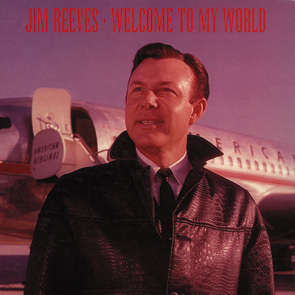 On 31 July 1964 pilot Reeves and his pianist/manager, Dean Manuel, died when their single-engine plane ran into difficulties during a storm and crashed into dense woods outside Nashville. The bodies were not found until 2 August despite 500 people, including fellow country singers, being involved in the search. Reeves was buried in a specially landscaped area by the side ofHighway 79 in Texas, and his collie, Cheyenne, was buried at his feet in 1967. 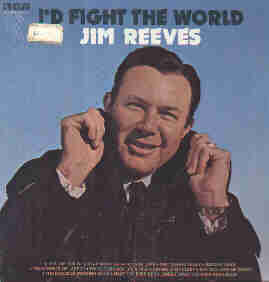 Reeves continued to have hits with such ironic titles as 'This World Is Not My Home' and the self-penned 'Is It Really Over?'. Although Reeves had not recorded 'Distant Drums' officially - the song had gone to Roy Orbison - he had made a demo for songwriter Cindy Walker. Accompaniment was added and, in 1966, 'Distant Drums' became Reeves' first UK number 1. He had around 80 unreleased tracks and his widow followeda brilliant, if uncharitable, marketing policy whereby unheard material would be placed alongside previously issued tracks to make a new album. 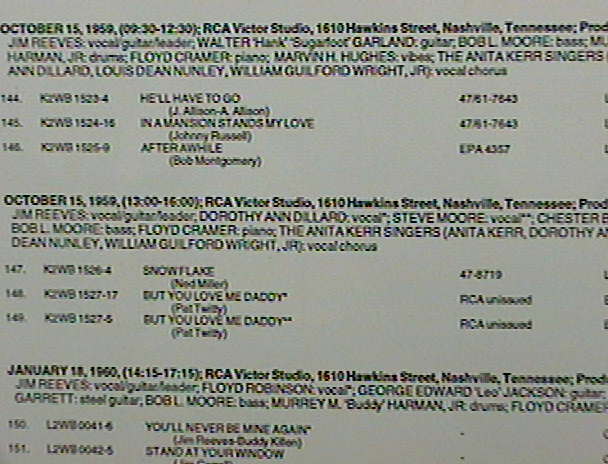 Sometimes existing tracks were remastered and duets were constructed with Deborah Allen and the late Patsy Cline. Reeves became a bestselling album artist to such an extent that 40 Golden Greats topped the album charts in 1975. 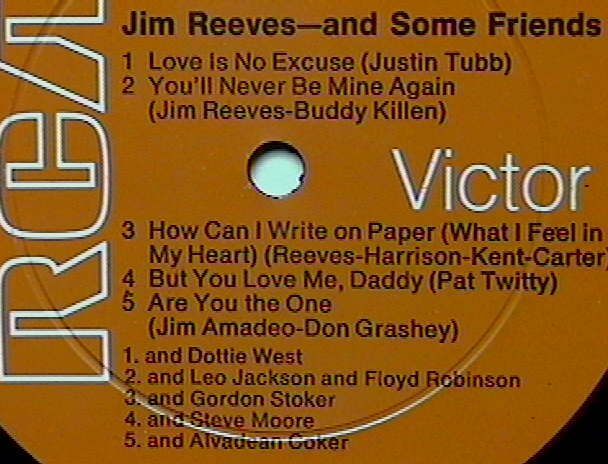 Both the Blue Boys and his nephew John Rex Reeves have toured with tribute concerts, and much of Reeves' catalogue is still available. Reeves' relaxed style has influenced Don Williams and Daniel O'Donnell, but the combination of pop balladry and country music is more demanding than it appears, and Reeves remains its father figure.